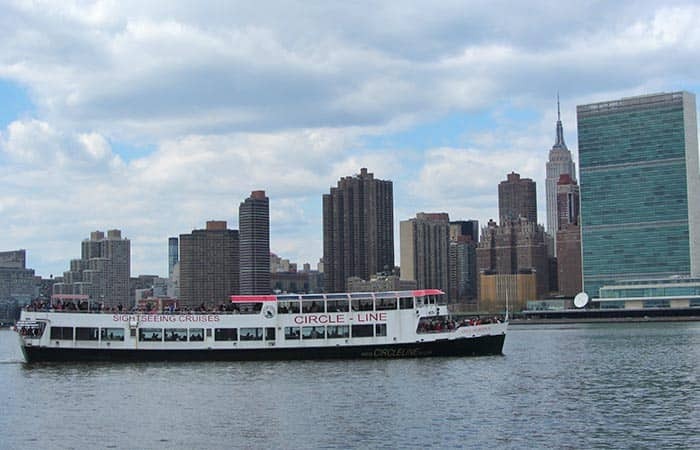 Circle Line Cruises in New York offer multiple great options for sightseeing by boat. If you want to see a lot of the city while relaxing, then this is something I can definitely recommend. All of the Circle Line cruises start at Pier 83, closeby the Intrepid Museum, at 42nd Street and 12th Avenue. You can easily buy tickets online before going to New York. The Circle Line Best of NYC Cruise is 2.5 hours and great if you want to see all of Manhattan. This cruise goes around the Manhattan island, and you will see the skyline, Yankee Stadium, Queens, Brooklyn, The Bronx and much more. You’ll also cruise under all of the bridges, such as the Brooklyn Bridge and the Manhattan Bridge which connect Manhattan with the rest of New York. If you’re interested in seeing only the highlights then the Circle Line Landmarks Cruise is for you. In a leisurely 1.5 hours you’ll cruise under the Brooklyn Bridge and pass highlights like the Empire State Building, Statue of Liberty and the Manhattan Skyline. Nothing beats the New York skyline, except the New York skyline at night! Take the Circle Line Harbour Lights Cruise and enjoy the twinkling lights on a 2-hour sightseeing cruise. On a tight schedule? The Circle Line Liberty Cruise is a great option. This 1-hour cruise will take you past the main attraction: Lady Liberty. Enjoy the Manhattan skyline too, as an added bonus. This cruise does NOT stop at Liberty Island. Sightseeing with a thrill – that’s the 30 min. Circle Line The Beast Speedboat Ride alright! You’ll travel at 72 kph towards the Statue of Liberty. Be prepared to get wet! Eric’s Tip: If you’re wondering about which cruise to take, go for the Landmarks Cruise. With this one you really can’t go wrong. It’s a semi-circle cruise of Lower Manhattan and takes you past the most important sights. If you want to see more of the entire island and relax, then opt for the longer cruise.